Excuse me, but the Triodion would like your attention. 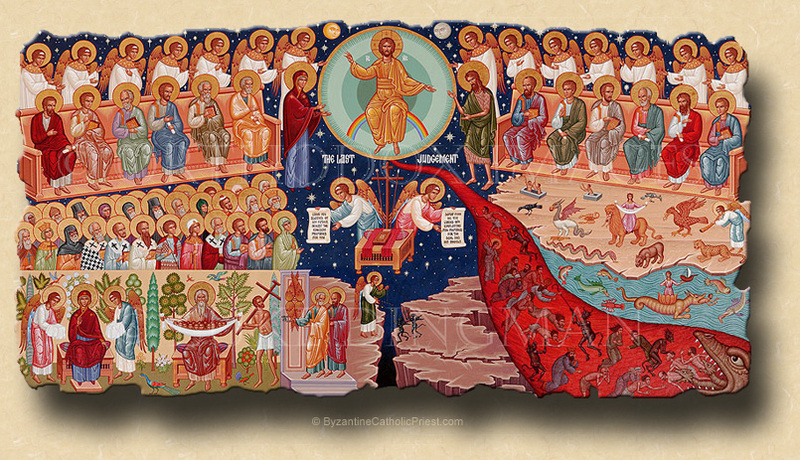 The Third Sunday of the Triodion, known as The Sunday of Meatfare or Judgement Sunday. Our Holy Father Melitius, Archbishop of Antioch. 3:08 AM 2/13/2012 — Last week I attempted to explain for you the theory behind this ancient practice we call the Lenten Triodion—a preparation for the preparation, I called it—in which we ease ourselves into a both a spirit and a practice of self-denial. The week of Meatfare, through which we just passed and which culminates on this day we call Meatfare Sunday, is part of it. It was—and is for those who choose to keep the Traditional Fast—the last day until Easter on which meat was eaten. To our ancestors in the faith, this all made perfect sense. The spiritual children of Cyril and Methodius lived an agrarian life where the winters were long and harsh. There wasn’t a lot of hard manual labor that could be done; so, it wasn’t difficult for them to turn their minds and hearts to spiritual things. Of course, our circumstances are different today. Our winters may still be long and harsh;—at least from our perspective—but life goes on no matter how much snow falls or how impossible the frozen soil is to turn: we have to get up, we have to go to work, we have to cook the food, we have to clean the house, we have to yell at the kids, we have to yell at our spouse, we have to do all the things we normally do. We are not naturally drawn by the season to retreat into ourselves and contemplate the things of God more; which, when you think about, makes these traditions even more important today. These weeks before Lent, especially Meatfare and Cheesefare, call us to focus on very concrete things for a reason. Jesus didn’t just sit down and think about what it would be like to fast for forty days in the desert, and then contemplate how that might change him; he actually went there and actually fasted. If my Lent consists of “I’ll give up desserts, I’ll cut an hour of my TV time, I’ll say an extra ten minutes of prayers each night...”, that’s wonderful; but it’s not Lent, because it’s all just symbolic. A symbol—whether it be a picture or a word or a symbolic act—no matter how meaningful it may be, is still just a ghost. If it has no substance, it cannot change me concretely. But if my Lent is not just a symbol—if it is something which I allow to completely reorient my life, turning me away from the things of this world toward the things of God to the extent that my state if life permits—then, over the course of a lifetime of Lents, it can make the difference between heaven and hell. And that—at the risk of sounding amusingly tempered—is not insignificant. Which brings us to the Liturgical texts for the Sunday of Meatfare: the Troparia of the Divine Liturgy, the chants of Vespers, and especially the Holy Gospel in which Jesus describes, in an allegorical way, the Terrible Judgment. It shocks us to read it, because we want to think of Jesus as this lily white quiet sort of man, who never gets angry, who always understands and who never requires anything;—like a schmaltzy painting on black felt—and here he is talking in graphic detail about the punishments that await those who do not repent. 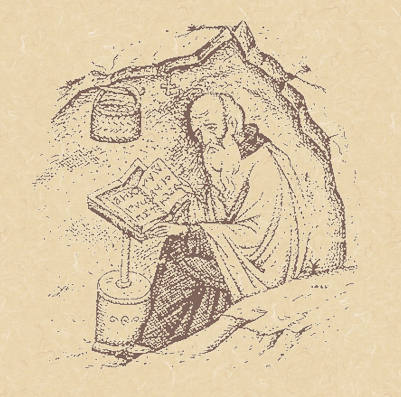 It should be obvious that there is a program to the course of the Triodion Gospels: the Sunday of the Publican and Pharisee showed us the efficaciousness of admitting our sins; the Sunday of the Prodigal Son showed us the willingness of God to forgive no matter what; but, just in case there’s somebody out there who isn’t getting the message, here’s what happens to you if you weren’t paying attention. What’s important to remember is that, in the parable which the Lord tells us today, those who are damned are not sent to hell by God; they send themselves there by their actions, or, in this case, their lack of action: “When I was thirsty you gave me no drink.” And then they’re so surprised in the end to find out that someone actually was going to hold them accountable. In contemplating the last judgment, we are led to hope for mercy if we have been faithful and merciful ourselves. Our Lord is merciful in the highest degree, but He is also just; and His judgment is grounded in the truth: the truth about Who He is, who we are, what we’ve done with our lives and what we have yet to do. If, when we emerge from Lent, we have a clearer vision of these things than we did before, then Lent will have done its job, because we will have done ours.